In the carpark of Southampton's Airport Parkway Station Mike Smales – the owner of Lyburn Farm – warns us that his Nissan Pathfinder is a farm vehicle. Unsure what exactly he means by this, the four of us pile in, engulfed at once by the sour-sweet aroma of cattle and the farmyard. David, smiling whimsically, remarks that he loves the smell. Traffic is inexplicably bad for a Tuesday morning, so Mike routes us through backroads in the New Forest. A national park of common land in the south east of England, it is roughly the size of Greater London. The forest is largely without fences, and animals roam freely, Mike explains, occasionally making an obstacle course of the morning commute. (Later, on the drive back to the station, we inch past donkeys and cows so close that we fold in the wing mirrors.) His driving is swift, the roads winding, nevertheless he remains engaging, offering us a history of the farm and its evolution into cheesemaking. The Smales have been milking cows since 1952, though they moved to their current location at Lyburn Farm in 1969. (Mike's father finally retired last year at age 91; his son Jonathan now looks after daily operations.) As the price of milk dropped through the '80s and '90s they decided to add value by producing cheese. They released their first wheels in 1999. Using a tweaked Gouda recipe, they began very small, setting up a stand at the Winchester Farmer's Market and selling cheeses locally. In the intervening years they have grown considerably, graduating from a 50-litre vat up to today's 3000-litre vat, increasing the daily make from five to thirty wheels. Relative to UK cheesemaking as a whole they're a small player, Mike assures us, but a big small player, he adds with a smile. We park in the dirt lot. The sky has a Constable quality. It's about half past nine but after the train journey it feels later. We follow Mike around their enormous milk tank and into the dairy, where he hands us off to Andy Bryant. For the past two years Andy has overseen the maturation, stock and order fulfilment. Three years ago, Andy – then a cheesemonger at Waitrose – took a tour similar to the one he was now guiding, and something clicked; he wrote a letter expressing his interest and once a job opened up he pounced on it. We sign in and are kitted out in white coats, wellies and hair nets. Surgeon jokes are made. As we wash our hands in turn, Andy updates us on our itinerary: a cellar tour, a cutting of the curds, a cheese tasting, and the cheese make (stacking curds, moulding, clean-up, etc.) followed – of course – by a visit to the pub. Through plastic strip curtains we enter a small room where new wheels are stored before their first coating of plasticote (a breathable sealant traditionally used on the rinds of Gouda). Andy comments on the size of the wheels; at 6kg they are indeed plump, especially compared to the leaner Old Winchesters we see in La Fromagerie. We pass through the brining room – a kind of glorified hallway with three vats of brine, salt content calibrated to 75%. The water is nearly opaque. Wheels spend twenty-four hours in the solution, but as it's the Tuesday following a bank holiday, the tanks are empty. Andy leads us into the ripening rooms. Thousands of neatly arranged cheeses fill our vision, floor-to-ceiling. The rooms are large but not dauntingly so – emptied, it would sound more like a house on moving day than, say, a gymnasium. Presently Andy projects his voice over a low thrum of refrigeration and a radio from another room. As a rule of thumb, the farther one ventures into the cellars the more mature the cheese gets – so, in order, we're shown Lyburn Gold, Lyburn Garlic & Nettle and Lightly Oak Smoked (each aged two-to-three months), Winchester (aged 9 months) and Old Winchester (aged 18+ months). Each style is given its own space, separated by a sliding door to allow for adjustable temperature and humidity controls. Andy shows us how batches are numbered: the colour denotes the year; days and months are handwritten. Lyburn Golds are turned daily; Winchesters and Old Winchesters are turned weekly. After two months the cheeses are graded. From the smile on Andy's face it would seem he finds this aspect particularly rewarding. A sample is tasted and together the team grades based on taste, texture, aroma and appearance. Occasionally a six will pop up, he tells us, but the past year has produced predominately sevens, eights and nines. (A ten is something like the platonic ideal of Winchester and is thus unattainable.) Much like Comte production in France, only after grading can they assess which wheels are better suited for another seven months of maturing, and which ones can go the full eighteen. In the back of the cellars, before a final sliding door, Andy turns and asks if we know what we're about to see. We shake our heads bashfully. He slides the door open and we're enveloped in a cool dank swell the approximate temperature of a turned-over pillow. The smell reminds me of lifting flagstones in the garden as a child – compacted soil and light-deprived vegetation. We cannot see our breath, which surprises me. Andy presents us Stoney Cross – Lyburn Cheese's answer to Tomme de Savoie and, given the other styles they produce, an outlier. Stoney Cross has a natural rind and is ripened so that a layer of mucor ('cat's fur' colloquially) grows over the rind. Years ago they introduced the moulds to the room. They've kept the spores alive merely by providing food (cheese) and a stable environment (temperature & humidity). Wheels are brushed with two goals in mind: to beat back the 'cat's fur,' which, without intervention, would completely overtake the cheese, and also to redistribute mould spores throughout the room. Between two racks, turning clockwise from nine to three, we're able to watch three months pass before our eyes: fresh wheels still crosshatched with cheesecloth beside wheels just sprouting patches of 'cat's fur' beside rustic fully matured wheels. The cellar tour complete, Andy guides us through yet another sliding door, placing us in a separate branch of the dairy. We remove our white coats. Following his recommendation we strip down to t-shirts. The cheesemaking wing is balmy. And without the drone of refrigeration it is silent, almost solemn. No overhead lights are lit and the reservoir of separated milk reflects three sunny windows, bouncing a warm yellow-greenish colour over the walls. We wash our hands and arms up to the bicep, don waterproof aprons and approach the vat as one might a wounded animal or a geothermal pool. The glassy surface, glanced with subtle imperfections, at once recalls certain childhood puddings, an iced lake and/or a rained-upon tarpaulin. Andy encourages us to touch it. Palm flat, it feels like water, but with some degree of give. Each morning the milking starts at 5.30am. By 7am the milk is transported up to the tank, where, for the next two hours, it is pumped through the pasteuriser and into the vat. The pasteurisation, we're told later in the day, is gradual but efficient: 21 seconds at 73°. Vegetarian rennet and starter cultures are added and the cheese make begins at 10.30am, which is where we've entered the process today. From a back room a man enters. He begins washing his hands and arms at the sink. He is large, with a linebacker's physique, bald below his hairnet. His beard is cleanly trimmed. In a thin white t-shirt and black athletic shorts above his wellies, he is something of a sight. This is our cheesemaker James Brown, Andy says as a means of handing over, and he departs. Drying his arms, James reintroduces himself. His bearing is warm and all of us are instantly put at ease. He calls in Steve Inder, an assistant at the dairy, and together they gather the implements for cutting curds – two tools roughly the shape of large cricket paddles. Inside the rectangular metal frames are a series of parallel north-south wires or east-west wires. We will use the north-south cutter twice, cutting in perpendicular rows so that the surface is scored with hundreds of squares. We'll then sweep the east-west cutter down the length of the vat, producing centimetre-sized cubes. In a gesture only earned by thousands of hours of repetition, James slips the wire into the curds and, seemingly without effort, draws it down the length of the vat. The curds warble in the cutter's wake, jiggling for an instant before resettling. We repeat this process in turns, reluctant at first – all of us doing our best to mimic James's firm offhandedness – then eventually with some degree of confidence. Wash your arms up to the shoulder, James says, it's time to move some curds. The four of us do as we're told and surround the tank. Put your hands in, he instructs us. Slowly at first, we slide our hands into the mixture. The feeling is at once foreign and familiar, almost amniotic. The curds are satin-soft and soothing, heavy but featherlight; they brush against our skin in a manner that is lulling, drowsy-making. Remarks are made about swimming in the mixture. The goal now is to coax more whey from the curds, but gently – overly contracted curds should be avoided, as should their inverse. James shows us how to do this, lightly scooping the curds from the edges, centre and bottom with relaxed hands and spread fingers. Our arms are wet up to the bicep in whey. Its colour has deepened into a rich yellow-grey hue. We connect paddles to the mechanised stirrers. James switches them on, languidly at first. This part is crucial as it keeps the curds from glomming together (which, we'll later learn, they're very keen to do) while simultaneously helping them release whey. From a rack on the far side of the room he grabs a kind of perforated kayak paddle and I'm assigned to keep the corners and floor of the vat clear of stuck and/or eddying curds. The rest of the team continues to agitate, clearing the tank walls, which are heated to keep the mixture at 33°. Before we go to our cheese tasting James gathers us together and tells us to collect a single curd from the vat. We each lift one from the swirling mixture. On our palms they rest, virtually weightless. They have the appearance and texture of panna cotta, but none of the mass. He suggests we place them on our tongues, not chewing or moving them for a moment, just letting them rest. We do. A subtle but unmistakable sweetness pours through my mouth – I recognise it from ricotta – as the curd expels its whey. The texture, fleeting as it is, is irresistible. As I begin to chew, the familiar curdy squeak emerges, and any sweetness is replaced by a flat, somewhat repulsive flavour more easily described by what it lacks: saltiness, sweetness, any trace of umami or complexity. Andy greets us at reception with a cheese board. We taste the varieties, five of which are essentially the same cheese with additions and/or levels of maturity, plus the Stoney Cross. We discuss strengths, favourites, concentrating as if something much greater were at stake, each of us happy, however, to be on the other side of a cheese tasting for a change. The Lyburn Gold, Winchester and Old Winchester are impressive insofar as they're the same cheese at different ages. Lyburn Gold leans toward Asiago or Edam, with a mild fruity front; Winchester is rounded, almost cheddary, with hints of butterscotch; Old Winchester is full-on burnt caramel, umami & broth – without seeing firsthand that age was their sole distinguishing factor I might not believe it. The Garlic & Nettle has, as David puts it, a guilty-pleasure quality. The smoked version offers another surprise – subtlety. Most oak-smoked cheeses have a domineering, almost liquid-smoke quality, whereas Lyburn's is only detectable after swallowing, and even then only faintly, when graceful hints rise onto our palates. We finish with Stoney Cross, which lives up to its inspiration. Like a Tomme de Savoie it possesses the contrasting butter and cave notes, with a good breakdown and a limber sort of balance. 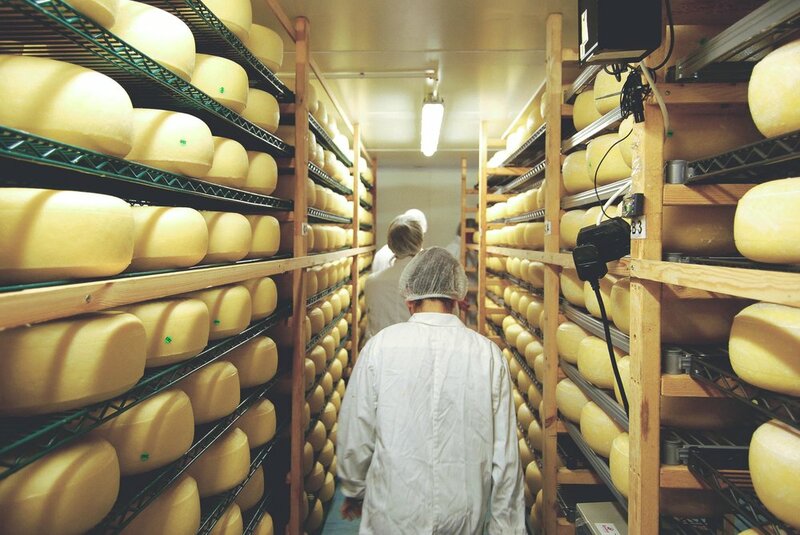 Andy guides us back into the maturing rooms where we are set to work turning cheeses. It's a simple process: off the shelf, flip, back on the shelf. Any remaining liquid in the curds is drawn down by gravity, and the action of turning is essentially a balancing act, keeping the cheese from going trapezoidal and lopsided or drying out. After we finish a row – some 300 wheels, say – it becomes clear why everyone here has large forearms. It's also valuable as an exercise to participate in an unglamorous aspect of cheesemaking and affinage: repetition. It really does take a particular demeanour to stay passionate, day in and day out, whilst continuing to extract meaning from monotonous tasks. It is deserving of anyone's respect. Cheesemaking time. Same procedure: down to t-shirts, arm-and-hand-wash, waterproof aprons, etc. This next phase is more physical, we're promised, and we will sweat. We are ushered in. The whole cheesemaking team is now in the room: James and Steve, plus another assistant named Amy Parker (who was kind enough to be photographed plasticoting a cheese earlier in the morning). The room feels even warmer. James seems, if not less relaxed, then more focused. (Whilst we've been away he's 'washed' the curds, which amounts to removing a portion of the whey and replacing it with water of equivalent temperature. This removes some of the lactic acid, resulting in the sweeter curds you'll find in alpine or gouda styles.) Whereas the curd-cut allows for a degree of looseness regarding timing, James tells us, the cheese-make must be efficient in order to avoid over-crumbly cheese down the line. After placing a colander in a bucket to catch any loose curds, he releases a valve at the bottom of the tank. The ensuing deluge is intense. In a matter of seconds it overflows the catch bucket, pouring over the concrete to a strip grate in the floor. (The grate drains to a tank where the whey is collected – high in protein, they supplement the cattle's feed with it.) Like children at the ocean, the four of us reflexively jump back from the creeping wave. Chuckling, James reminds us that our boots are clean and the floor is clean and we needn't be too concerned. After about half the whey is drained he gathers us around the vat for our first moulding. To get the hang of this process we're starting with 1kg moulds, small varieties of Lyburn's usual offering. In his left hand he takes a mould (a flexible pouch, made of very fine wire, topped with a sturdy plastic ring), dips both hands deep down into the murky whey and gathers a heap of curds into the mould. He lifts it out, dripping. With his right hand he stops the curds from spilling, keeping pressure firm on a curd-dome cresting the rim. He places this behind him on the table in a fitted plastic cup that keeps it upright. James is patient and encouraging. We mirror his process, garnering frankly undeserved compliments, filling a metal table with similarly curd-packed moulds. Next up is the 'first turn.' James wriggles one of the moulds free from its plastic cup, places his hand securely over the top of the curds and, in a graceful series of motions that continue to mystify me, flips it over while lifting the mould-pouch as one might a cloche. Balanced on his open hand, the curds stay perfectly in place; an elongated, well-formed dome – essentially a half-finished cheese. (Someone says, 'Oooo.') Then – with the efficiency of movement of a multitasking parent holding an infant – he swiftly places the empty pouch-mould back into its cup and drops the curd-form back into its mould, albeit upside down. The entire process takes maybe five seconds. We repeat, finishing twenty moulds in ten-ish minutes. Every cheesemaker does this next phase differently, we're told, and there is no 'wrong' way to do it, as such. Re-opening the valve, James releases the remaining whey, herding curds to the edges, opening a channel down the middle. The channel allows for more even drainage. He places us on either side of the vat, spaced evenly, and gives us instructions. We're to grab handfuls of curds and break them up between our fingers and thumbs in a motion not unlike flicking sugar from one's fingers, stacking them to facilitate drainage. The action itself is strenuous, almost painful; for the duration my forearms look like someone else's: extra muscles appear, veins bulge. By the end we have two symmetrical snowdrifts of curd sloping down to a valley of whey-seep. The mood in the room is suddenly one of determination and focus. Directives are shorter and chatter has stopped. Also country rock has somehow started playing over the sound-system(?). Steve rolls over a drain-table arranged with empty Winchester moulds. He hands the empties to us and takes them once they're packed. We layer the curds in handfuls, breaking them up as we do it, eliminating air pockets until each mould is full. As the vat empties James and I use a converted dustpan to squeegee stray curds – nothing going to waste. The 'first turn' of the full-sized moulds is, on principle, the same procedure, however because of the increased size and weight it's more difficult. Steve demonstrates. Using a one-armed hugging gesture (think a bully giving a 'noogie') he allows the cheese to drop from the mould by its own weight. Like James earlier, he now balances a half-moulded cheese on his hand, and again like James he eases it economically back into mould, upside down. Particularly fascinating at this juncture is the adhesion of curds; they bond so quickly and so thoroughly that even with a half-moulded cheese balanced on our hands, no stray curds drop. In fact perhaps the notion of 'stray curds' is largely visual. By appearance they seem loosely stacked together, random and haphazard, where in fact they are fully cohered. Breaking them up earlier at the vat, David notes, it would be only a matter of seconds before strays became clumps became a mass. Fascinating. Once we've finished, we place lids onto each mould and then stack them in the presses. Here they will drain off still more whey, before a second turn and brining. Clean-down is exhaustive but the mood is jubilant – an air of accomplishment keeps us buoyed. Ana and Lucy squeegee the floor, David and I scrub the tables while James, Steve and Amy clean the vat and look after details I fail to notice. By the time we finish the room looks more or less unused and all of us are red-faced, sweating. It has been good. At work the following day Andrew, the Cheese Room manager, suggests we call Mike to see if it's possible to mark the wheels we've made in the hopes of selling them once they're matured. Logistically it's probably unfeasible, but as a thought exercise it helps to draw perspective: the same flavourless curd that melted on our tongues that morning in May, through time, via hidden alchemy, will become something else altogether. We taste the Winchester in the cheese room, imagining past and future at once.